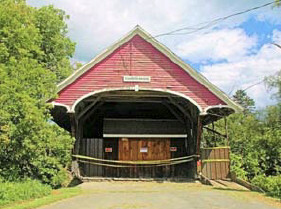 The Sanborn covered bridge in Lyndonville, Vermont, is a prime example of the Paddleford truss developed by Peter Paddleford of Littleton, New Hampshire. Why is the bridge closed? Flood damage has caused lower and upper chords on the downstream side to fail. This caused the bridge to sag more than two feet. It was closed for fear that it would collapse. What is being done to save it? 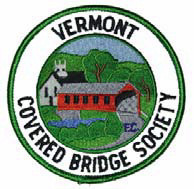 The National Society for the Preservation of Covered Bridges (NSPCB) and Vermont Covered Bridge Society (VCBS) have joined forces to see that the bridge is restored. Donated the labor and funds necessary to build a stone island and wood cribbing under the broken timbers minimizing the immediate danger of collapse. Met with local officials to gain their support. 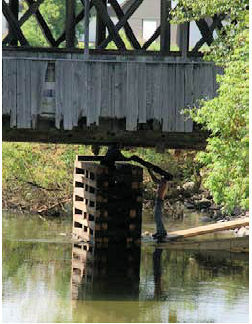 Immediate repairs are needed so the bridge can stand on its own. Once able to support itself, the bridge needs to be moved off the river and placed on dry land. Replace the bridge over thePassumpsic River. 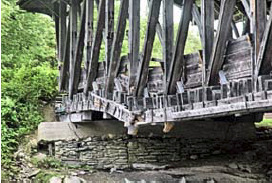 If it went out to competitive bid, approximately $1.2 million would still be needed to complete the restoration so that visitors could once again walk and drive across the Sanborn Covered Bridge. 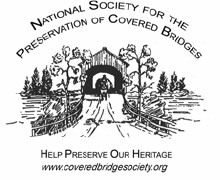 Donate to the project from the NSPCB website - www.coveredbridgesociety.org/sanborn.htm. 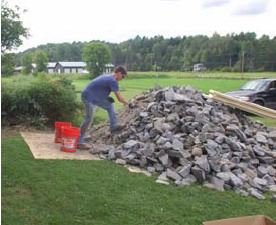 Donate by sending a check payable to NSPCB to: Michelle Andrews, NSPCB Treasurer, 9 Damson Lane, Gilford, NH 03249-7857. Be sure to note that it is for the Sanborn Bridge project.